In the bowels of the Foot Clan’s Hudson Block facility, the Turtles face off against the three mutant Shredder clones: a speedy and agile midget, a lanky one with claws and a hulking brute with four arms. 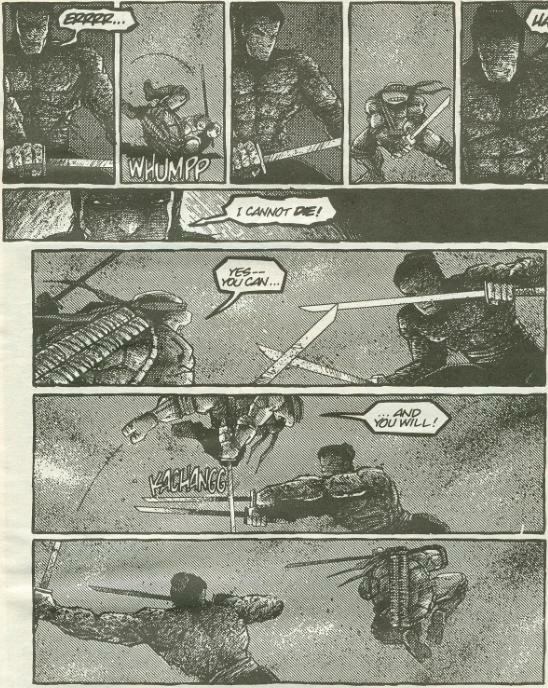 Raph breaks away from the pack, insistent on killing Oroku Saki himself. Leo kills the four-armed Shredder and chases after his brother, leaving Don and Mike to battle the clawed Shredder and the midget Shredder. The clawed Shredder lures Don onto a catwalk made of electrical cables, centered over a large exhaust vent, and the two go one-on-one. Racing down a hallway, Raph is ambushed by the Shredder’s Elite Guard. Taken unawares, he is beaten to the ground. Leo arrives in the nick of time to save him, finishing all four Elite Guards on his own. Recovering, Raph tells Leo he was wrong to break away from the group. Raph encourages Leo to deal with Saki while he helps Don and Mike finish off the mutant clones. Back in the basement, several Foot Soldiers have arrived with machineguns, making Don and Mike’s battle that much more complicated. The clawed Shredder has Don on the ropes. Thinking fast, Mike picks up Don’s discarded staff and bats the midget Shredder right into his clawed kin. The two creatures fall into the open exhaust shaft where they are caught in an explosion and vanish. 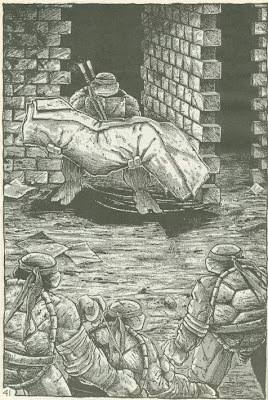 Unfortunately, now both Turtles have become pinned by machinegun fire. Taking down the Elite Guard at the door, Leo enters the top floor lobby and finds the Shredder meditating in preparation for battle. Leo demands to know how he survived being blown to bits by his own thermite grenade three years ago. The Shredder humors Leo, explaining that the Foot Clan is resourceful in both the mystic arts and modern science. Gathering his remains, they fed the pieces to a rare and curious worm that takes on the aspect and consciousness of whatever it eats, joining with other worms feeding on the same specimen, eventually becoming a completely new lifeform. The three mutant clones in the basement were failed attempts. Removing his armor, the Shredder reveals himself to be the true Oroku Saki, though the regeneration process has left him with a body looking like ground beef. Plucking up his swords, Saki is ready for battle. Down in the basement, Don and Mike run out of shuriken and there are still plenty of gun-wielding Foot Soldiers left. Raph comes to the rescue, driving a robot-armed forklift into the crowd of ninja. On the roof, Leo and Saki begin their duel. The two are evenly matched, going blow for blow and taking critical damage from the other’s blade. Saki kicks Leo through a window and the two continue their fight onto the roof of the building. Back in the basement, Raph picks up a stray rocket-launcher from one of the smashed crates. He fires the launcher, but the missile ends up hitting a large vat, unleashing a wave of liquid onto the Foot Soldiers and his brothers. On the roof, Saki has Leo dead to rights and prepares to deliver the finishing blow. However, the damage caused by the rocket in the basement has created a tremendous explosion which knocks Saki off balance and saves Leo’s life. As the building explodes around them, Leo and Saki charge at one another and, leaping into the air, strike their swords at the same time. The explosion in the basement has set the entire building on fire. Don, Mike and Raph run from the flames, fighting their way through any Foot Soldiers getting in their way. Left with no alternative, they leave Leo behind, escaping into the sewers as the whole building goes up. Later, down in the sewer lair, Leo returns from his battle. In his arms is the decapitated corpse of Oroku Saki. Honor finally being restored, the Turtles believe their mission to be over. Leo, however, tells them they have one last thing to do. Out on the bay, the Turtles watch as Saki’s corpse is cremated in a funeral pyre; the Shredder’s helmet resting on Leo’s sword, planted in the ground. *This story is continued from TMNT (Vol. 1) #20. Chronologically-speaking, I would place TMNT (Vol. 1) #45 next in sequence due to it taking place in New York City. *The Shredder last appeared in TMNT (Vol. 1) #10. He was killed in TMNT (Vol. 1) #1. *A behind the scenes look at Shredder’s resurrection can be seen in TMNT (Vol. 3) #24. *The surviving mutant Shredder clones will return in TMNT (Vol. 3) #25. *The worms containing Oroku Saki’s consciousness will form a new menace, the Shark Shredder, in Tales of the TMNT (Vol. 2) #3. So this is it. “Return to New York” is completed and holy cow, was it a trip. For a guy who was only in a grand total of four issues, Oroku Saki was a most epic villain in the Mirage series. I think his lack of on-screen presence is what made him so incredible, in that he was a true “overlord” type villain that only got his hands dirty when the situation absolutely required his direct involvement. And in the three battles he engaged in with the Turtles over the course of the comic, he approached each of them intelligently and strategically, forcing the Turtles to run a gauntlet of Foot Soldiers before reaching him. I remember in the animated movie “Turtles Forever”, one of the characters made the claim that the only constant across the multiverse is “the Shredder’s big fat ego”, but I think I would disagree with that. The only time one could claim the Mirage Shredder ever succumbed to his pride was when he responded to the Turtles’ challenge in TMNT #1, and even then, he weakened the Turtles with wave after wave of Foot Soldiers before taking them on in person. Naturally, his pride led to his downfall and after getting a second lease on life, he didn’t make the same stupid mistake again. In both the Leonardo #1/TMNT #10 story arc and “Return to New York”, Shredder’s attacks were anything but egotistical. For their first encounter, the Turtles were untested enemies, which could excuse Shredder only bringing one unit of Foot Soldiers to battle. But for his counterattacks, Shredder pretty much pits them against his entire army before they could even have a shot at taking him on at full health. Again, for a guy who was only in four issues, Mirage’s Shredder was a pretty great villain. I’m rather glad that they never “truly” brought him back, as “Return to New York” was about as far as they could go with the character before turning him into an “I’ll get you next time, Turtles! NEXT TIME!” type of recurring villain. The Mirage Turtles fight to kill and for the Shredder to keep coming back over and over and over again, that would paint the TMNT as being pretty incompetent at their trade. There is, of course, the question of whether this Shredder was the “real” Shredder or just a “clone”. His description of the worms’ methods can leave it up to interpretation, I suppose, though I saw it more as him being crudely “stitched” back together, with his “essence” still remaining within the repaired body. Though whether he was a “clone” or not, this Shredder still retained the personality, memories, skill and consciousness of Oroku Saki, so the argument seems a little moot. As for the mutant Shredder clones, I felt they were taken out of the fight a bit too quickly; I’d definitely have liked to have seen more of them. I didn’t really feel they got to show off their individual traits enough before being killed. Still, midget Shredder is hilarious. To talk about the final epic showdown between Leo and Saki is to also talk about the art; laid-out by both Eastman and Laird, with finished pencils by Jim Lawson. While the panels being so haphazardly strewn about the page make for a lot of empty white space, I felt it worked for the best. There are a LOT of panels per page in this issue, especially during the fight scenes, and having them all stacked one on top of the other would make the pages extremely claustrophobic-looking; like trying to read an old Golden Age comic where there are twenty panels per page because people in the 30s still wrote comics like they were a collection of newspaper strips. The big two-page spread of Leo chopping Saki’s head off is, hard as it is to believe, very subtle. The 4Kids adaptation went with the tired old samurai movie/anime cliché of having both parties land after the midair strike, with the hero in the foreground and the villain in the background, both pausing momentarily until the villain’s head falls off… and Christ almighty, I HATE that hackneyed bit of Japanimation action staging. 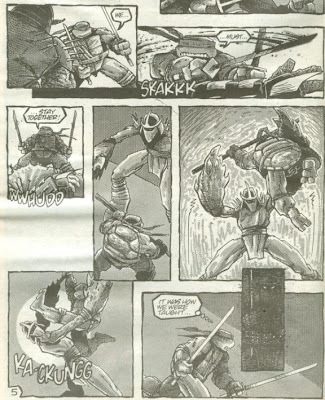 In the original comic, though, you don’t see them land, you don’t see Shredder’s head fall off, you don’t see the immediate aftermath of that strike; just the two-page splash with a thin white line separating Saki’s head from his shoulders, indicating who won the fight. Absolutely perfect. Sadly, Eastman and Laird would exit the series on a creative level following this epic storyline. 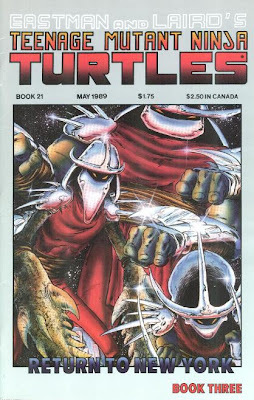 What follows is the dreaded “guest era” of the series; 24 consecutive issues of indie comics collaborators crafting ridiculous, surreal and often times stupid non-canon Turtle stories while the ongoing narrative is completely abandoned. Okay, okay, that’s a bit melodramatic, I admit. Two issues between TMNT #21 and TMNT #45 are confirmed by Laird as canon (TMNT #27 and TMNT #28, specifically) and several issues are written to function within the ongoing storyline and not act as non-canon wastes of time (Veitch’s “The River” trilogy, for example), and a few alternate takes are genuinely good (Zulli’s “Souls Winter” trilogy), but the vast majority of the next few years of TMNT (Vol. 1) will be comedy relief garbage by guest writers and artists. I hope you enjoyed “Return to New York”, because you won’t be seeing anything as awesome as this in TMNT (Vol. 1) for a long, long time. So, which do you think is the more "WTF" way of resurrecting Shredder: him really being Wrym, or him really being Krang? Last night, I came across a recent Pink Panther cartoon (circa 2009) on TV, which actually contained a parody of 4Kids' interpretation of the decapitation of Shredder by Leo. Only was this some generic Marvelesque bad guy, which was 'cut' to pieces by the eraser on the back of Panther's pencil (the story itself was basically similar to Donatello #1, with the Panther as Kirby). Not sure if it was actually a parody of the scene from the 4Kids cartoon or a different, older samurai or ninja anime toon, but it sure seemed like a reference to Leo's fight with (Utrom) Shredder. But since it had strong similarities to Donatello #1 (in a story that revolved around the feline wanting to buy a copy of Superman #1), I'd like to think the writer is a Turtles fan. Or at least someone who knows his comic book and manga tropes. Do you think that any of the other turtles could have defeated Shredder? Or was Leo the most skilled one for the task? I don't get the Alan Moore reference. Explain?